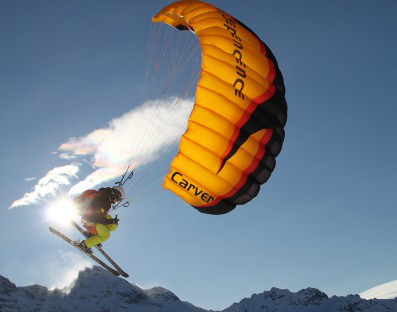 The new Speed-Riding glider "Carver" offers the perfect combination of dynamic and stability and is setting new standards in this quite young form of sport! Its profile together with the trimmer risers gives the pilot the possibility to fly in a very wide speed window. The very efficient and accurate brake of the Carver enables the pilot to convert the speed easily into hight and allows to fly sharp turns. Sizes available: 11m² and 15m². 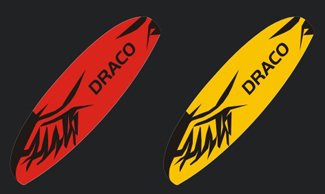 The main difference between the Draco and a conventional Speed-Rider is the much better gliding-performace of the Draco. Flying in strongwind-conditions, groundhandling, but also classic Speed-Riding are possible with the new Draco. 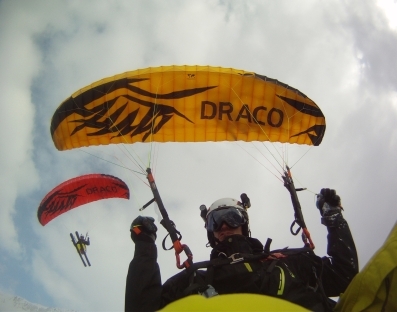 The profile and the canopy-geometry give the Draco a very high stability, but also offer a very good gliding-performance for such a small canopy. This enables even thermal-flights in applicable conditions. Sizes available: 16m² and 18m².